Pope Francis is only 16 years older than me. 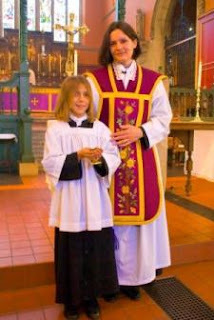 However His Holiness is ordained a priest only 11 years longer than me. His latter years in the seminary was a time of constant confusion, change and chaos. Combine this with a political culture in Argentina and South America which is constantly in flux and chaos and you get a person who thinks life is meant to be confused and in constant chaos. However, it is also clear that Pope Francis drank the post-Vatican II "spirit of Vatican" koolaide and liked it and never looked back. 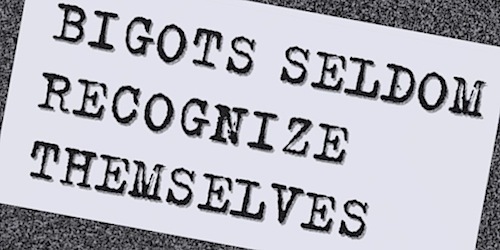 I can resonate with that because I drank the very same koolaide, was taught by the very same liberation theology theologians and had instilled in me that the spirit of Vatican II was a gift to the Church of the God of surprises! Yes, this term, the God of Suprises is a manipulation used by the revolutionaries of the spirit of Vatican II a faux infallibility or neo-infallibility to justify such an outrageous spirit. I honestly thought that in the 1970's seminary I was living the Church of the future, the Church of the 2000's and that when I was ordained, my calling was to lead people forward to this Church of the Future, with women clergy, no patriarchy and a liturgy creatively designed by the local community which was and is the real Church. We would be a poor Church for the poor. Pope Francis seems opposed to women priests, but who really knows. He doesn't strike me as a liturgical revolutionary either but he clearly has a disdain for the liturgy of the Church prior to Vatican II, a sort of self-hatred. I don't agree with everything in this synopsis from 1 Peter 5, but so much of it is true! 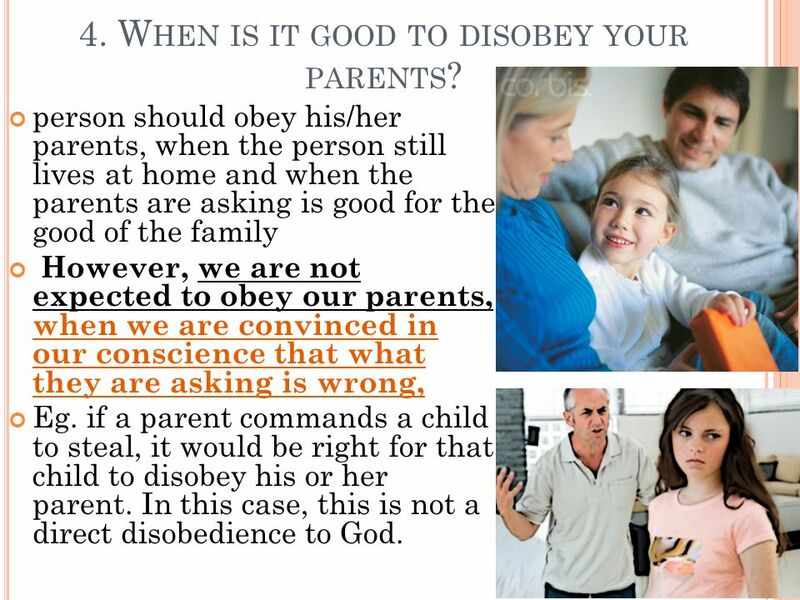 DID JESUS JUST BREAK THE 4TH CATHOLIC COMMANDMENT--HONOR THY FATHER AND MOTHER? It does appear that Jesus was just a wee bit disobedient in staying behind in Jerusalem, not telling His parents that He would and the insolent manner in which He addresses His blessed mother when she and Joseph find Jesus in the temple. And can we also recall the arrogant way in which Jesus spoke to His Mother when she told her Son "they have no more wine?" So, tell me about the homily you heard this morning. Was Jesus portrayed as a disobedient smart Alec or not? Of course my post is to provoke thought because as the Church teaches, I believe that Jesus remained sinless throughout His life beginning with the age of reason. 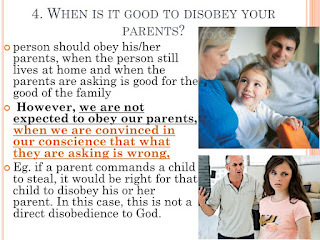 But I must admit as a child and teenager, it appeared to me that Jesus had a disobedient streak, which of course the Church teaches is a mortal sin. So how do you explain these passages from the Scriptures and just when did Jesus become sin so that we might become the righteousness of God? Could this becoming sin have been a gradual process (graduality) beginning with Jesus' escapade of absenting Himself from His Holy Family? HILTON HEAD/BEAUFORT COUNTY NEWSPAPER AD GONE WILD! This newspaper ad appeared this Saturday morning in the South Carolina Island Packet that serves Beaufort and Jasper Counties where there are at least six Catholic parishes many which cater to tourists. Will this ad help tourists or disappoint them when they arrive at their nearest Catholic Church? Is this ad a waste of money? 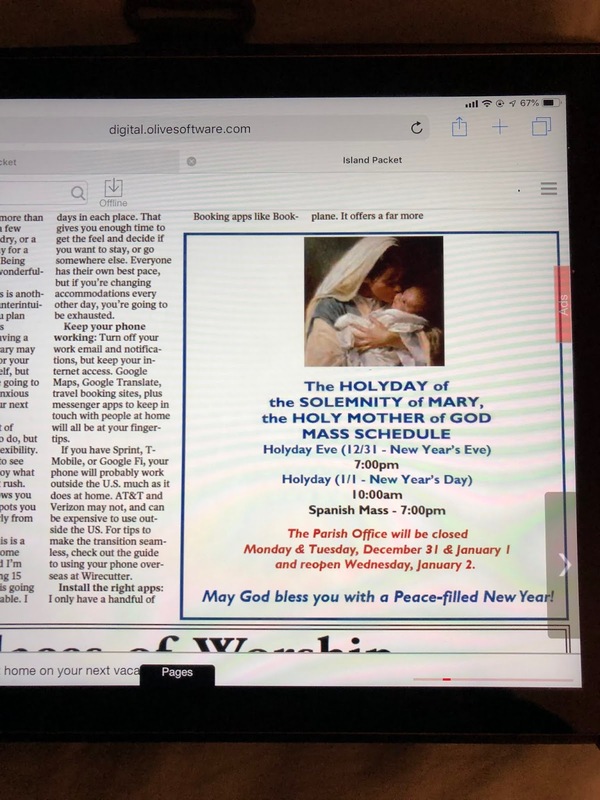 Should the newspaper refund the cost to the parish which purchased it? So what’s wrong with this ad??????? I am asking lawyers and/or judges about the elimination of the statue of limitations. Should these laws be eliminated for the sake of justice when it comes to pedophilia? In the last couple of days more very disturbing information about the extreme perversions of a bishop stripped of his cardinaliate has come from one of his victim who describes in pornographic detail his abuse and reported at Church Militant with these details described. The man now in his 50’s says these assaults began to take place when he was eleven and in some cases while McCarrick heard his confession! There is evidently a canonical trial of sorts happening with the confessional details adding a new detail for a canonical prosecution of the McCarrick case. If McCarrick is found guilty he could and should be laicized (defrocked) as any priest would be just on the abuse evidence. But the Church has no power to incarcerate and if McCarrick wanted to break the penance imposed on him by the pope he could walk and live on his own, unless he is extradited to Vatican City which has a jail, but there would have to be a civil trial there. But what about civil law in California where this man was first assaulted (raped?) in the late 1950's? If not for the statute of limitations McCarrick could be arrested and placed on a civil trial there with real prison time a possibility. Justice would then be served. Could a case going back to the late 1950’s be successfully prosecuted in civil trials today especially where there is no corroborating witnesses, only a he said, he said scenario? The other interesting twist in all of this is that the now adult victim is on a crusade to reform the Catholic Church of it post Vatican II modernism which he believes has led to this kind of immorality increasing after Vatican II with little to no accountability for miscreant bishops and priests, only winks and nods and maybe a transfer or time in a mental health institution so the miscreant could be recyled. Is Pope Francis' footnote in Amoris Laetitia a sign of this post-Vatican II modernism and so-called "mercy" where adulterers, fornicators, sodomites and other perverted sexual acts are minimized and allowed all in the name of mercy or graduality that "might" lead toward conversion and a change of course? I happen to think so because it is the modernism of the new morality of Vatican II which Pope Francis embraces without critical thinking about its ramifications. Or maybe he does, because it doesn't take much of a leap to other immoral irregularities in people's lives that are public, such as giving communion to those not in a Sacramental Marriage, simply living together, heterosexual, homosexual or with minors, as well as to non Catholics who have never gone to sacramental confession and may not believe what the Catholic Church believes about any of the Sacraments. We have commented on big sleeved poofy, voofy albs. But if a priest insists on wearing one or has no money to purchase a new, more disciplined sleeved alb, shouldn’t he at least wear a long sleeved clerical shirt, black or white, if not a cassock to prevent this horrific partially naked look at Mass? ARE WE IN A LITURGICAL MALAISE UNDER POPE FRANCIS? The papacy of Pope Benedict XVI produced quite a bit of "brick by brick" excitement as it concerns the liturgy of the Church. Even the ultra silly Praytell Blog couldn't prevent that excitement on many of its comments until the gestapo cracked down on it. While Pope Francis hasn't halted the EF Mass or Summorum Pontificum, a fear that many have had and still do, there simply isn't any liturgical enthusiasm generated by his pontificate. As everyone knows, I love the EF Mass and hope that it will spread more than it has, but that authentic renewal of the Liturgy cannot ignore Vatican II's document on it. Thus the true hope of the Church is what Pope Benedict XVI enunciated, that one day the two forms of the one Roman Rite must coalesce to produce a new Roman Missal organically developed. I continue to proclaim that the template for this is the Ordinariate's Divine Worship, the Missal. It has returned to the Ordinary Form so many EF options, like the format of the Missal, the use of the Prayers at the Foot of the Altar, the reorientation of the Introductory Rite to be more like the EF's. It has recovered many EF rubrics as it concerns the Canon of the Mass. It allows for the three-fold Dominus Non Sum Dignus. 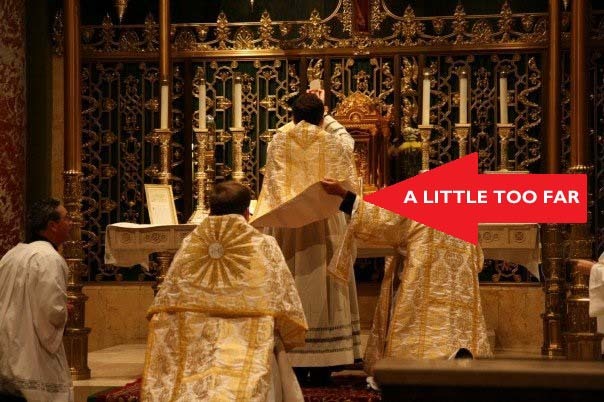 It makes possible ad orientem and kneeling for Holy Communion. 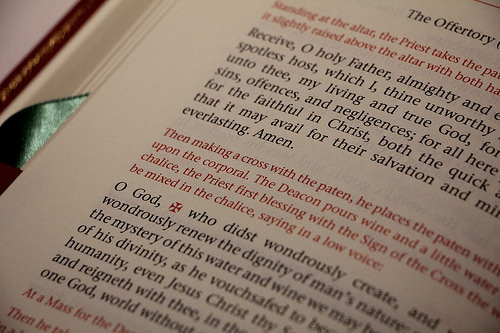 The gradual is directly in the Missal as it is in the EF Missal along with all three antiphons, the Introit, the offertory antiphon (missing in the current OF Missal) and the Communion antiphon. Its calendar has also recovered many elements of the EF Roman Calendar. But sadly there has been no movement on the Ordinary Form for the majority of Catholics to have what the Ordinariate Missal allows now. That is a scandal and shows the malaise we are currently experiencing as it concerns the organic development of the Ordinary Form Missal. How many of you have witnessed more EF Masses in your area and more solemn-EF-like Ordinary Form Masses? Not many I bet! THE DEACON'S BENCH SAYS IT ISN'T SO, BUT I SAY IT IS SO! SO THERE! My comments: Even if the 12 Days of Christmas isn't a subversive way to preserve the Catholic Faith during Christmas, it is within our grand Catholic Tradition to spiritualize practical and secular things, to say the least. The Advent Wreath, Christmas Trees, Halloween customs all were baptized and given Catholic meaning and spiritualized. The same with various actions in the Mass, such as washing hands, cutting the wine with water, the use of incense. There was a practical need to wash hands after receiving the offerings from the congregation to include dirty things living and dead. The wine was strong and sour and needed to be cut with water, people smelled pretty awful and often animal were in the great spaces of cathedrals and churches and so incense was like Fabreeze is today--a deodorant. 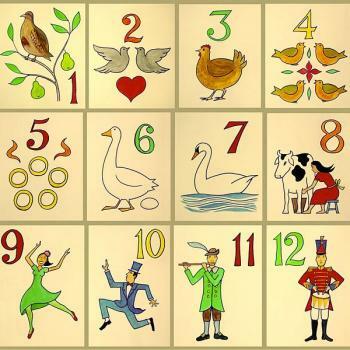 So I'm sticking with the spiritualized content of the 12 Days of Christmas, although I have never liked the song even as a child, but I digress. WHEN DOES CHRISTMAS END? THE DAY AFTER CHRISTMAS? NEW YEAR'S DAY? THREE KINGS? BAPTISM OF THE LORD? GROUND HOG DAY? I like Ground Hog Day as the end of Santa Claustide! It is a great day to celebrate with whole Hog barbecue and an endless loop of the best end of Santa Claustide movie everrrrrr, Ground Hog Day! This article is very good! Is it just me but isn't the 1962 Roman Calendar far superior to the just plain, blah, Ordinary Form Calendar? For newbies to the Extraordinary Form, they would certainly think that the 1962 Roman Calendar is in reality the new and truly improved calendar, no? This post was originally published in January 2014. It is revised and now includes the 1962 Extraordinary Form dates for Christmas. This post contains tables which may not be easily displayed on mobile devices. The Christmas season ended on the Feast of the Baptism of the Lord. Or did it? It seems inevitable every Christmas that there will be polite disagreement among Catholics as to when the Christmas season officially ends. Usually the discussion revolves around when to take down the Christmas decorations. Most of my friends will wait until after the Epiphany or after the Baptism of the Lord. But every year someone will say that that they are following the traditional and official end of the Christmas season, February 2nd, 40 days after Christmas, which is the Feast of the Presentation of the Lord or Purification of the Blessed Virgin Mary(commonly called Candlemas, in Greek Hypapante). I wonder if it is mainly an argument of semantics? Is the dispute over the actual length of the Christmas Season, comparing the Ordinary Form calendar with the older 1962 Extraordinary Form (or even earlier calendars)? Or is the disagreement over the Christmas Cycle (or Period or Section) and not the actual liturgical Christmas season (also known as Christmastide)? Or is this about “tradition” (small “t”) not related to the Church, but a longstanding secular family or cultural custom? I have always enjoyed studying and understanding the structure of the liturgical calendar. I am from a family of seven children, and I know and celebrate all the birthdays and anniversaries and even death anniversaries of all my siblings, parents, grandparents, aunts, uncles and cousins. When I was newly married, I added new celebrations to our calendar—my husband’s birthday, our anniversary, my in-laws’ birthdays and anniversaries. As the years progress, I’ve added my children’s birthdates, their sacrament anniversaries, and other milestone dates. These dates have become familiar to me and even more dear than my original family dates. Through my baptism I became a daughter of God and a member of the Family of Christ. Shouldn’t I get to know the dates and ins-and-outs of the calendar of my other family, the Church? The Liturgical Year has many intricacies. 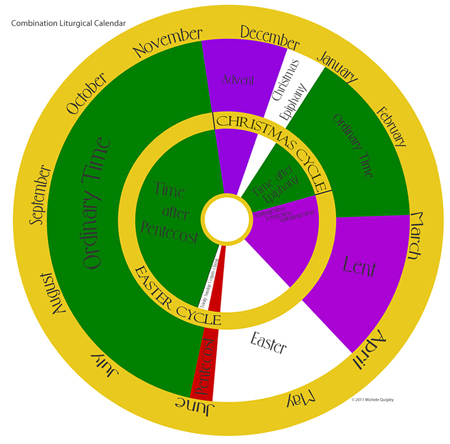 The Sanctoral Cycle (calendar with the feasts of the saints) is usually easier to follow because the dates are fixed (with some exceptions) but the Temporal Cycle of the liturgical seasons (which follows the redemptive life of Christ) is more changeable from year to year. How will the Church seasons fall during this particular Liturgical Year? How is the date chosen for Easter? Will Lent and Easter be late or early this year? Will Advent be short or long? What day of the week is Christmas? How long will be the Christmas season? I equate looking at the Church’s calendar to my family looking ahead to see what day of the week their birthday will be this year. So it is with this thought process I want to understand more closely whether or not Candlemas is or has been part of the Christmas season. Although there are several differences between the current General Roman Calendar (also referred to as the Ordinary Form or OF) and the 1962 Extraordinary Form Calendar (EF), the structure of both of the liturgical seasons is still very similar. Below is a combined calendar (created by my friend, Michele Quigley) of both the Ordinary Form and Extraordinary Form calendars. Sunday falling on or closest to 30 November and ends December 24 (4 Sundays). December 25, Christmas until the Baptism of the Lord inclusive, from 15 to 20 days long (2-3 Sundays). December 25, Christmas until the Baptism of the Lord, January 13, inclusive, 20 days (2-3 Sundays). Monday after the Sunday following January 6* (Baptism of the Lord) and continues until Tuesday before Ash Wednesday inclusive (4-9 weeks during this time before Lent). January 14 to Saturday before Septuagesima Sunday (0 to 5 Sundays). Septuagesima Sunday to Shrove Tuesday (3 Sundays). Ash Wednesday until the Mass of the Lord’s Supper exclusive, 43 days (6 Sundays). Ash Wednesday to Holy Thursday, includes Passiontide (6 Sundays). Holy Thursday, Good Friday and Easter Vigil on Holy Saturday. 50 days from Easter including Pentecost (8 Sundays). Easter to Saturday after Pentecost (8 Sundays). Monday after Pentecost and ends the First Sunday of Advent (24-28 Sundays). Ordinary Time weeks total for the year, 33-34 weeks. Trinity Sunday to Saturday before Advent (23 to 28 Sundays). Comparing the two calendars, the colors and weeks do not vary except the three weeks of Pre-Lent beginning with Septuagesima (I do think the white section after Pentecost is the same for both calendars, for Trinity and Corpus Christi Sundays). In the sections of green, which is in both calendars Tempus per Annum, “The Season Throughout the Year,” the designations of titles differ. Both “Time after Epiphany” and “Time after Pentecost” are the two names used to designate which part of the Tempus per Annum falls in the Extraordinary Form Calendar, whereas in the current Ordinary Form these are both designated as “Ordinary Time,” but both calendars view this time/season as a whole. Examining just the Christmas seasons of each calendar, Christmas begins on December 25 and has an octave of Christmas ending on January 1. Epiphany falls on January 6, except in the current US calendar where it is transferred to Sunday. Each calendar has the Christmas season end on the Feast of the Baptism of the Lord, which is moved to Sunday (with two exceptions) in the current (OF) calendar, but always January 13 in the 1962 (EF) calendar. In the current (OF) calendar, the length of the Christmas season varies depending on what day Christmas falls. In 2017-18, the Christmas Season lasted 16 days, but it can vary in length from 15 to 20 days. The following table illustrates how the feasts would fall and the length of the season depending on the day of the week Christmas falls. *When the Solemnity of the Epiphany is transferred to the Sunday that occurs on January 7 or 8, the Feast of the Baptism of the Lord is celebrated on the following Monday (General Roman Calendar, Roman Missal 3rd Edition, 2011). In the 1962 calendar, the length of the Christmas season (or Christmastide) is fixed at 20 days, because the feast of Epiphany is not transferred to Sunday and the Baptism of the Lord is always on January 13 (with one exception**). **When January 13 is a Sunday, Mass and Vespers of the feast of the Holy Family are said, omitting the commemoration of the feast of the Baptism of the Lord. There are some shades of differences, but in both calendars the Christmas season does not continue after January 13 and cannot be longer than 20 days in length. The main difference in comparing the two calendars is that many pre-Vatican descriptions divide the year by two cycles, the Christmas and Easter Cycles. Some use terms like “Period” or “Section” to try to illustrate the division of the year. The seasons of Advent, Christmas, and Time after Epiphany point to the Incarnation of Christ and the feast of Christmas, so the seasons make up the Christmas Cycle. TheEaster Cycle consists of pre-Lent, Lent, Easter and Time after Pentecost. This was a later division and designation and not always mentioned in translations or missals that I have found. While the official descriptions in Church documents of the current Ordinary Form calendar don’t have these separate designations, I have found the separation of Christmas and Easter Cycles described in various books, including Adolf Adam’sLiturgical Year: Its History and Its Meaning After the Reform of the Liturgy, which was written for the current OF (1969) calendar. There does seem to be a natural division, but the documents do continually emphasize that the Paschal Mystery is at the center and heart of the Liturgical Year, and all events of the Liturgical Year point back to that one central Feast of Easter. There is no balancing of Christmas vs. Easter; Easter is the highest feast of the whole Liturgical Year, and this is reflected in every Sunday being another Easter, and the length of the Easter Season is actually 50 days, compared to Christmas which is 20 days at the most. There are some weaknesses in the argument that the Christmas season or celebration continues through February 2nd. Some confusion can stem from older writings, such as Dom Prosper Guéranger’s The Liturgical Year, citing the importance of the number 40 (which ends at Candlemas) and the parallelism with Easter, and his use of the term “Christmastide” for that whole time period from Christmas to Candlemas. But in The New Rubrics of the Breviary and Missal (1962), Christmastide is defined as “(tempus Nativitatis) from I vespers of Christmas to none [midafternoon] on 5th January inclusive.” The OF or current calendar does not use this term. Secondly, Pre-Lent (or Septuagesima) in Extraordinary Form calendar, which begins with Septuagesima (the ninth Sunday before Easter), often falls before February 2. For example, 2015 it fell on February 1st, and in 2016, January 24. So the focus in the Extraordinary Form cannot continue celebrating Christmas when pre-Lent arrives. Even the Christmas Cycle ends earlier during those years. Also, the Christmas season always ends on the Feast of the Baptism of the Lord in both calendars. I have never found any traditional Church calendar that continued the “Christmas Season” all the way through Candlemas. It is more of the “Christmas Cycle“ that one can see prolonged Christmas focus for 40 days of Christmas which ends on Candlemas. The Christmas Cycle is different than the actual Christmas season. After the Baptism of the Lord, the Christmas Season ends. The priest wears green vestments, and “Time After Epiphany” begins. The green in the “Basic Cycle” or “Tempus per Annum” is not a celebration like the Easter and Christmas seasons, but does continue to focus on the Manifestation of Christ. It is not Christmas anymore, but a time of spiritual growth, applying the gifts we have learned through the Advent and Christmas seasons. And it is a time of rest before the Easter Cycle begins. But the time is not the Christmas “celebration.” No one says it is still Easter as the summer months continue or on All Saints Day, or the Solemnity of Christ the King, even though that time could be considered part of the “Easter Cycle.” The same rules apply to the Christmas Cycle. The green vestments signal a time of no feasts. As mentioned under the tables above, tempus per annum or Ordinary Time is included in both calendars and is considering liturgically one seamless time. Although there are designations of “Time after Epiphany” and “Time after Pentecost” in the pre-Vatican calendar, the masses are interchangeable and linked through both time periods. In the EF or 1962 liturgy, the masses not used during the first part of the year in “Time After Epiphany” are tacked on at the end of the “Time after Pentecost” cycle, showing the seamlessness of the readings and liturgy. In looking at the calendar, cycles, and seasons, it seems Candlemas was born as a date fixed to Christmas, and originally this feast was February 14, forty days after Epiphany. The Emperor Justinian in 542 shifted Christmas to December 25 for the whole eastern Empire, which moved the Presentation to the current date of February 2, 40 days after Christmas. This feast day, not part of a season, concludes the focus of the Christmas Cycle. It is a feast that points back to Christmas, when the Light of the World was born, but even more so leads forward to Easter, where we celebrate Lumen Christi (the Light of Christ). The only remaining liturgical hint of the Christmas Cycle is within the Liturgy of the Hours. The Marian antiphons of the Liturgy of the Hours do reflect the change of focus on the Incarnation of Christ to the Paschal Mysteries. The Marian Antiphons sung at the end of the Night Prayer shift after the feast of the Presentation of the Lord. Alma Redemptoris Mater began the first Sunday of Advent. Ave Regina Caelorum is sung from February 2nd until the Easter Vigil. Christmas decorations before the Victorian period were minimal, mostly evergreens and herbs and crèche scenes. Modern times tend to have much more decorations, including lights and Christmas trees. So while decorations might have remained until Candlemas, they weren’t as invasive as current Christmas decorations. I do think many people like to follow this tradition because the actual Christmas season is exhausting, and waiting until February 2nd is easier than having to take down all those decorations after a harried Christmas. While there is no proof that the Church has continued the Christmas season for 40 days until Candlemas, the feast of the Presentation of the Lord does stand very prominently and is considered a “Christmas feast day.” The tradition including the feast of Candlemas as part of the Christmas season is not liturgically historical, but indicating that it is part of the Christmas Cycle during the Time after Epiphany is liturgically correct. The Vatican takes down the Christmas decorations after the Baptism of the Lord, except the crèche/nativity scene. There seems to be more indication that keeping up the Christmas decorations is a cultural custom rather than an official religious Tradition. In our own homes and families, we can follow familial or cultural traditions in our homes. But if we are trying to follow the Liturgical Year, it is important to know the Church’s calendar and liturgy to know what is correct to form our domestic churches. POOFY, VOOFY ALBS AND CHASABLES, SHOULD THESE BE BANNED? On December 21st as I was celebrating Mass on my 65th birthday, and after a week of hurting my knee, pulling a muscle in my back, and my 2012 Nissan Murano breaking down in my rectory garage on a Sunday as I was going to drive 8 miles to Mass, which meant the car had to be towed to a mechanic and be fixed for over $1,100, something wierd happened to me at my birthday Mass! Well, after I offered the bread and wine during the OF's Preparation "offertory" prayers and had bowed down for the prayer after that, but prior to the Lavabo, I noticed that there was no bread on the paten! So I had to tell my adult server to go and get a large host for me. So he left the altar and there was this awkward OF silence with nothing happening and after a little while of waiting, I felt I had to tell the congregation why nothing was happening. There was no host which was needed for a valid Mass. 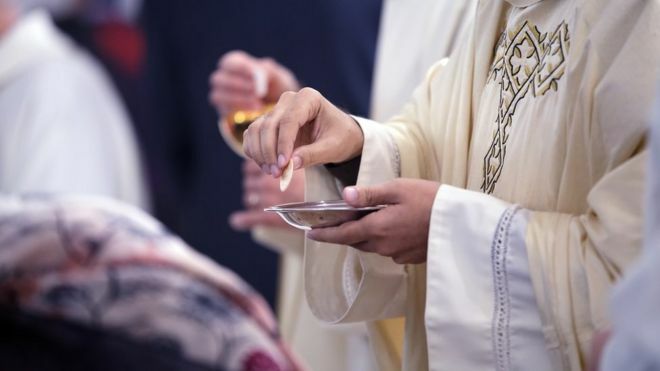 And I kept thinking to myself how in the name of hell and all that is unholy did I not notice that there wasn't a host on the paten while I was holding the paten for the prayer over the bread? So the host arrived, I reoffered the paten prayer with the host on it and has we were singing the Sanctus, and yes in Latin, I noticed the other adult acolyte walking in front of the altar and bending down to pick up a large but uncosecrated but previously offered host. What had happened is that I had unknowingly knocked the large host off the paten with the sleeve of my alb or the chasable itself when I was placing the chalice back on the corporal. 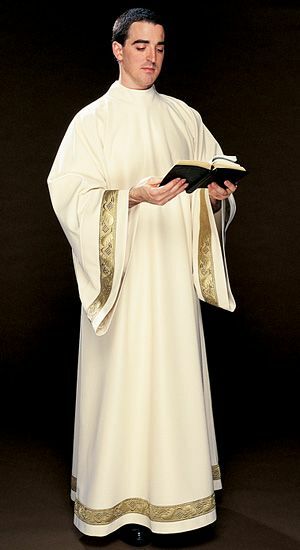 My modern albs aren't that poofy and voofy but the sleeves on them are not as disciplined as the traditional pre-Vatican II albs are. Thus the potential of knocking host off the altar or knocking over a full chalice looms possible. Maybe this is the reason for Roman chasables and traditional Roman albs, to help prevent such mishaps? 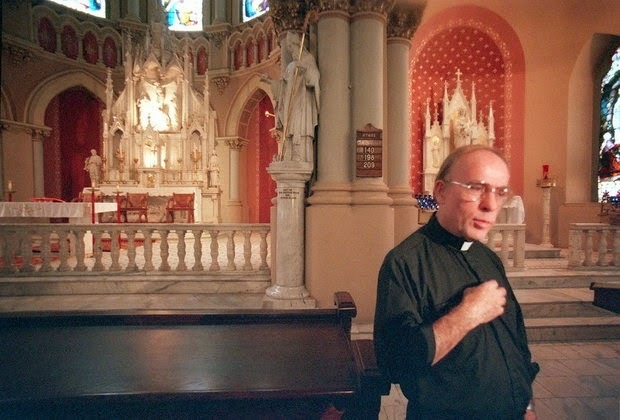 IS YOUR PRIEST A FAKE? AND IF SO, ARE HIS "SACRAMENTS" VALID? A man who pretended to be a priest for more than 18 years has been dismissed by the Catholic Church in Spain. An imposter priest, not too much different than someone in Anglican Orders, has been found out in Spain after 17 years of faking it! The article I link below states that the Church will recognize his baptisms and weddings, but not Masses and Confessions. Will the penitents who did not know and may never know go to hell for all their still unforgiven mortal sins? And what about all those Mass intentions over 17 years? Whatever happen to the doctrine of "the Church Supplies" precisely for these kinds of fakeries? I have shown this video before and it is an actual Mass Hollywood filmed for an actual movie. It is a small portion of "The Mass of the Ages," taken from the Deanna Durbin feature film, "Christmas Holiday." It was filmed at the former Los Angeles Cathedral, Saint Vibiana which was severely damaged by an earthquake. Even Protestants and secularists and non believers found this form of the Mass quite beautiful. It was quite the evangelizer! What is stunning is that so much of this Christmas Midnight Mass is incorporated into the movie! And please note that the communicants begin to approach the altar railing exactly at the point the priest is receiving His Holy Communion to complete the Sacrifice. 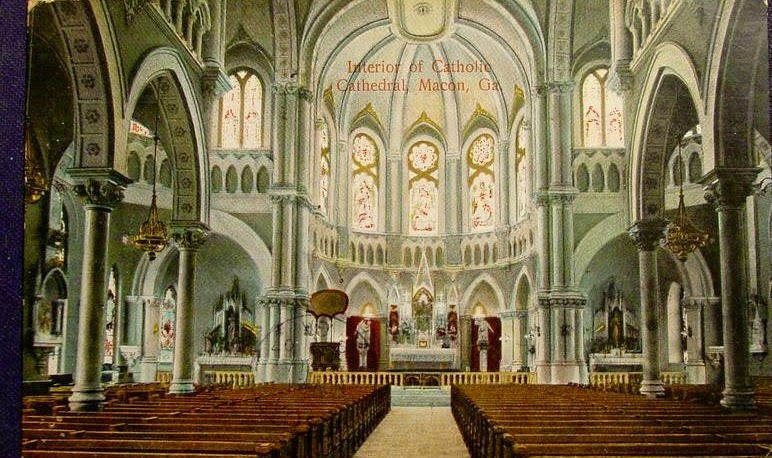 Thus by the time the Confiteor is chanted for the congregation, communicants are kneeling at the altar railing and others are standing in the aisle. As soon as the priest turns toward them for the absolution, even those in the asile will kneel for it and the Ecce Agnus Dei and their Domini Non Sum dignus. This is how I recall communicants approaching the railing prior to Vatican II! A BLESSED CHRISTMAS TO ALL! IN THE KINGDOM TO COME WHERE GOD'S WILL IS DONE, ALL IS CALM ALL IS BRIGHT; SLEEP IN HEAVENLY PEACE! Gentle tunes and soothing words that touch the soul: The magic of “Silent Night” has remained uninterrupted for 200 years. A song that promises consolation and gives hope. Over and over again. years ago, Joseph Mohr, a priest from Salzburg, and Franz Xaver Gruber, a teacher from Upper Austria, sang the song for the very first time at the St. Nikola Church in Oberndorf near Salzburg. The original poem was authored by Joseph Mohr, whereas Franz Xaver Gruber added the melody on his request. Only a few years later, singing families from the Zillertal valley carried the song from Austria into Europe and the rest of the world. Today, the song is performed in over 300 languages and dialects. 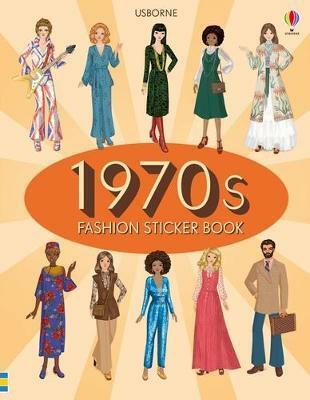 I used to get very impatient on Christmas Eve morning when we would get so many, and I mean, so many, phone calls and people asking "what time is Midnight Mass?" I wanted to to add explicatives to my answer when I said curtly, MIDNIGHT! YOU (BLEEP, BLEEP, BLEEP). But today so many parishes don't have midnight Mass any more. 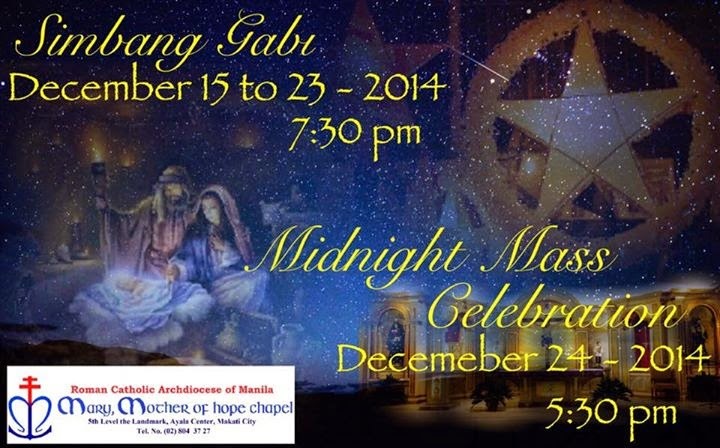 The vigil Mass is at 4 pm and the Mass at Night is now around 8 or 9 PM. And yes, I have a confession to make. This is my third year here at St. Anne in Richmond Hill, Georgia and this year, like the previous two, our Midnight Mass will be at 9 PM preceded by a prelude of Christmas Carols at 8:30 PM. Until I came here, I never missed a single Christmas as a priest either being the priest MC of the Midnight Mass or the celebrant or concelebrant. At 65 years old, I must also confess, that I am glad that our Midnight Mass at Saint Anne's if finished by 10:15 or 10:30 at the latest. 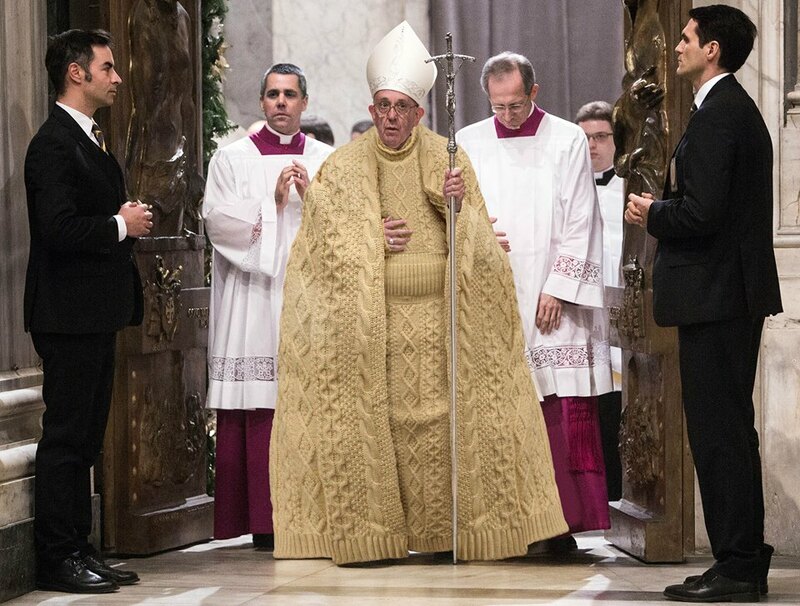 I think Pope Benedict started having the Christmas Midnight Mass at 9 PM at St. Peter's which Pope Francis has chosen to remain in continuity at least on this one with Pope Benedict by continuing with Midnight Mass at 9 PM. So what time is your Midnight Mass? Mine is at 9 PM, sweet darling. Our Vigil Mass is at 5 PM preceded by the Children's Christmas Pageant at 4:30 PM. The 5 PM Vigil Mass of Christmas will be the most packed and maybe standing room only. Our church seated about 1,200! We only have one Mass on Christmas Day and it will be at 10 AM and using the readings from the lectionary for Mass at Dawn. To be honest, I wish that we would not have vigil Masses at Christmas, that the first one has to start on Christmas Day which would be Midnight or 12 AM. Then we would have more Masses on Christmas Day. Do you agree with the order and content of this list? What would you add? SHOULD ALTAR RAILINGS BE RESTORED AND USED? YES--BUT WHICH STEP SHOULD IT BE PLACED UPON? WHEREIN I MUSE! Most people, meaning liturgists, who are less pliable than terrorists, ripped out altar railings because they proclaimed an ideology that it was like a "fence" fencing the altar off from the downtrodden laity. It was a barrier to the laity and made it look like that the sanctuary was more important than th nave and blah, blah, blah, blah! At Saint Joseph Church in Macon in the Year of Our Lord, 2015, I restored the altar railing which, by the way, I removed in 2005, in the Year of our Lord. But when I restored it, thanks be to Pope Benedict XVI and Summorum Pontificum, I did not restore it to the same location as you can see in the photo above with the former pastor standing in front of it, Msgr. John Cuddy, now deceased since last year but pastor their from 1974 to 2004 and pastor emeritus once I came in 2004 until he died in 2017. But I digress. As at our Cathedral today, the altar railing at St. Joseph was three steps up which made it difficult for elderly people, like me, I just turned 65 yesterday, to approach and God-forbid, if the communicant forgets when he stands up to return to the pew there are three steps below him, this is a recipie for a bad fall, life threatening injuries and even death! At the cathedral there are adult altar servers positioned in the nave before the railing to assist older people to come down the steps. When I restored the altar railing at St. Joseph, in the Year of our Lord, 2015, I moved it to the first step leading to the sanctuary, not the third. What say you about the position of the altar railing?